This idea popped into my head the other day on my way to work. Rice Krispie treats with a new twist. I love Rice Krispie treats and I know they have been done several ways, but I don't think anyone has used dulce de leche before, so I wanted to be the first. Remove from heat. Add dulce de leche and stir until all incorporated. Then add Rice Krispies cereal. Add white chocolate chips and carefully blend into the Rice Krispies mixture. Some of the chocolate may melt. When cooled, melt chocolate squares per directions on package and place in a piping bag or Ziplock bag with tip snipped off. Drizzle the melted chocolate in diagonal pattern across the Rice Krispie treats. The combination of the dulce de leche and the white chocolate was fantabulous. And with just that hint of semi-sweet chocolate...perfection! They were a big hit in my household and also at the office. I will definitely be making these again. They are not too sweet and very light. You can't help but eat more than one. For Nutritional Information click on the magic button. hi there, can you tell me where i can find "dulce de leche"? thanks so much, love your recipes!!! My sister-in-law bought it at a Spanish market for me. I know William Sonoma sells a good brand of dulce de leche. I also found some on Amazon.com. My sister-in-law says the La Salamandra brand is good. It's from Argentina. Since she is from Argentina also, I trust her judgement. Crunchy treats are fun in the morning...My kids will love this! This is brilliant! I'll be making these VERYYY soon. Thanks for sharing with us at Marvelous Monday this week! Will be pinning and sharing on FB. 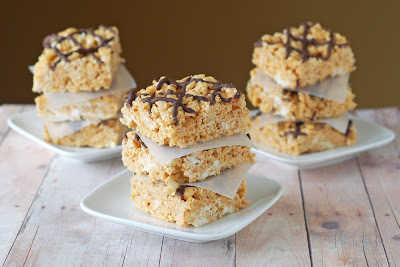 Love rice krispy bars and these are kicked up a notch!